A recent publication suggests that Electronic Data Capture systems, or EDCs, should be implemented in clinical trials. 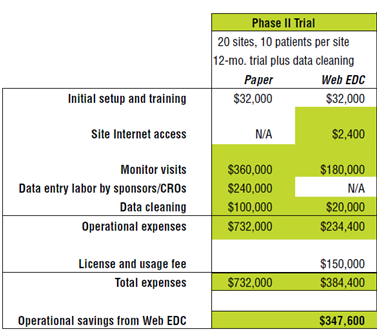 The EDC software can reduce the overall trial costs by an estimated $347,600 in a phase ll trial of 20 sites, 10 patients per site and a duration of 12 months plus data cleaning. See the table. Table: Forrester Research Paper versus EDC cost comparison. In this example, monitor visits still costs $ 180,000. Vitaphone CTS provides solutions to make subjects monitor their vital signs at home. This can also enhance their trial compliance. Re-activity is a top priority to create better and more efficient clinical trials. The tools developed by Vitaphone CTS will send biosensor data immediately and thus ensure almost real-time data. Our medication adherence support system (MASS) stimulates the study subjects to take their study medication. Remote monitoring and support enables pharmaceutical, biotechnology and medical device industries to focus on the development of the best drug or device. Using telemonitoring solutions, investigators can improve patient safety. This might be achieved through faster notification of adverse events to the Principal Investigator, CRO or Sponsor. This will support earlier and better decision-making. Embrace technology. The combination of remote patient monitoring of Home Blood Pressure Monitoring (HBPM) using alert thresholds and a Telemedicine Service Center, together with a provider team including experienced Family Care Coordinators could positively affect hypertension trends in just 30 to 60 days. The combination of remote patient monitoring described above with Family Care Coordinators could produce a positive patient experience, encompassing the patients’ perceived ease of use of the devices, interaction with staff, interest in continuing the program, and whether the patients would recommend the program to others. In a comprehensive publication in US Pharmacist, the Director of US Pharmacy’s Clinical Services, Mr. Meece, concludes that pharmacist-based assessment and monitoring can result in improved adherence to medication; in this case to insulin therapy. Mr. Meece found studies that report positive effect of pharmacist interventions on treatment outcomes and adherence. Medication therapy management (MTM) is a service designed to improve collaboration among pharmacists, physicians and other healthcare professionals and enhance communication between patients and their healthcare team. Another tool is motivational interviewing (MI): a method for interacting with patients. Although the results are (very) positive related to adherence, quality of life and healthcare costs (less hospitalizations), the pharmacist’s efforts to get these results are not the average activities in a pharmacy. It’s up to regulators to find the right incentives for pharmacists to use techniques like MTM and MI. Nevertheless, this article stimulates companies like us to keep on supporting pharmacists with tools so they can further improve patient’s medication adherence! From Holter to event monitoring! An article of the NIH, National Institutes of Health, states that a dramatic leap in mHealth will take place when we have small, inexpensive wireless devices with sensors that monitor our physiology. This means our heart rate, blood pressure, blood sodium and glucose levels, breathing patterns, brain waves and so on. These can then be transmitted to the physician, who can in his turn take actions that may spare you a trip to the hospital or even save your life. In a clinical trial, a wireless adhesive patch was tested next to the traditional technology (the Holter) to measure heart activity. With the traditional technology, the Holter must be worn for 24 hours; it records the full 24 hours. Getting a good reading is particularly challenging when the arrhythmias occur episodically. The adhesive patch can be carried around for a longer time, like a week. The patch had 15% less use-able readings in the first 24 hours but people were asked to wear it until they could tolerate it. The subjects wore the adhesive patch for 11 days on average. Because people wore the patch longer, there were significantly more (96) use-able readings than with the Holter (61). Nice data that demonstrates cardiac event monitoring works. Cardiac event recording is available and can function as replacement for the Holter monitoring! Comparison of 24-hour Holter Monitoring with 14-day Novel Adhesive Patch Electrocardiographic Monitoring. Barrett PM, Komatireddy R, Haaser S, Topol S, Sheard J, Encinas J, Fought AJ, Topol EJ. Am J Med. 2014 Jan;127(1):95.e11-7. The European society of cardiology recently published the results of their survey on remote monitoring of cardiac implantable electronic devices (CIEDs). The aim of the survey was to get insight into the current use of remote monitoring (RM) of CIEDs in Europe. Responses were received from 54 centres belonging to the European Heart Rhythm Association (EHRA) electrophysiological (EP) research network. Some interesting results: a total of 76.5% of the centres reported that they are actively using remote monitoring. RM is most used for implantable cardioverter-defibrillators and rarely or never used for routine pacemaker checkups, because the latter seems to be less cost-effective. In 29,8% of the European centres, the delay between detection of an abnormality by RM systems and the physician’s response is within 24h. The face-to-face 6-month check-up visits are drastically reduced by RM. Only 17.6% of all centers perform internet check-ups at predefined intervals. In only 6.4% of the cases information obtained by RM is incorporated into the clinical patient file! Why is that? Also in 25% of the centres, there is no specific workflow designed for RM. Only with a clear workflow follow-up and registration of the findings is possible. Almost 40% of the patients reported to prefer RM as their main follow-up management, because it helps to avoid unnecessary visits to the hospital. We believe RM will become more and more accustomed! For the 23.5% of the centres that not use RM; let’s make it happen! Vitaphone wishes everybody a happy & prosperous 2014! “The number of community-dwelling MDD users in The Netherlands increased strongly in recent years till 360.000 in 2011.”1 A clinical study in the Netherlands demonstrated that through multidose drug dispensing, patients older than 65 years of age have a better medication adherence than patients with normally dispensed medication! So patients who get their medication on a roll adhere 23% better to their medication. And interesting part of this study is that they also measured the knowledge of patients of their medicines. The result was that; “the percentage of patients with adequate knowledge was lower for MDD users (40%) compared with non-MDD users (79%, P < 0.001).”1 Patients using the MMD system know less of the individual medicine in that system, but the adherence is much better. The conclusion is: “Knowledge is only one of the many factors that could influence adherence. Forgetfulness and practical difficulties with medication management (e.g. removing medication from its primary packaging) might be more important barriers to adequate adherence in this specific group of older patients.”1 Within the group of MDD users, the knowledge of MMD drugs was low: “35%”1 while the knowledge of non-MDD drugs was very high “92%”1. It’s a very nice study that shows that you don’t have to know anything about your medication to be adherent! There is an ongoing drug abuse epidemic. Watch the video to get an overview of the problem in Oklahoma, USA. PDMP, a prescription monitoring program, is one of the most promising resources to help clinicians identify, intervene and curb drug prescription abuse. PDMPs are state-run electronic databases – functioning in 47 U.S. states and territories – that track the prescription and dispense of drugs to patients. 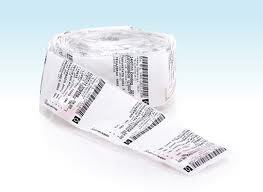 Pharmacists report to a PDMP each time a prescription is filled for a controlled substance medication. When this information is available at the point of care, it can help clinicians to distinguish between patients who legitimately need opioid medications and those who may be seeking to misuse these drugs. While PDMPs can serve as a valuable tool, most clinicians typically don’t use them. This is largely because they have been devious or time consuming to access (especially when outside of a clinician’s normal prescribing workflow). We see the need to automate this. But what we also see, is the need to support patients that take these medications. Our solution is a real-time monitoring of the intake moments. We think this could be integrated with the health IT systems used by these physicians. Interoperability is essential in this. And last but not least: implement the solution within the physician’s workflow! Recently published data from the Fukuoka Stroke Registry in Japan clearly suggest that a high poststroke blood pressure was significantly associated with unfavourable clinical outcomes in patients with acute ischemic stroke. This indicates the importance of thorough blood pressure monitoring in these patients. Telemonitoring could play a major role here: patients do not need to travel whilst they are safely monitored by healthcare professionals. This kind of monitoring is one of Vitaphone’s core competencies. The actual measurement of blood pressure at a patient’s home is one thing, but the service delivered once the data are sent is another one. On this, Vitaphone has been a key player over the last ten years, delivering services, from our unique in its kind, ISO-certified telemedical service centre. Recently, the results of a systematic review on the clinical effectiveness and cost-effectiveness of home telemonitoring (TM) or structured telephone support (STS) strategies were published. Both strategies were compared with usual care for adult patients who have been recently discharged (within 28 days) from acute care after a recent exacerbation of HF. Telemonitoring during office hours was the most cost-effective strategy with an estimated incremental cost-effectiveness ratio of £11,873 per quality-adjusted life-year compared with usual care. To us as a telemedicine company the results did not really come as a surprise, and we will continue our journey of letting these solutions serve as many patients as possible.